This fall, we were very pleased to welcome Kurt Haunreiter has the new manager of the Paper Science Center in Bloedel B-14! He arrived at the beginning of October, right when classes started, and he’s been scrambling to get the paper lab back in shape. “It’s been kind of a whirlwind,” he says. Haunreiter, who lives north of Everett, Wash., earned a bachelor’s in chemistry from the University of Washington, and then a master’s from the Georgia Tech Institute of Paper Science and Technology. He started in the industry as an analytical chemist for the James River Corporation in Camas, Wash., and then held positions as a process engineer, tissue operations manager and pulp manufacturing superintendent at Kimberly-Clark in Everett. A big part of what attracted him to this position was the opportunity to work with students, and this quarter he’s been assisting Professor Anthony Dichiara with BSE 248: Paper Properties. He attends every class, making sure the lab is ready and writing simplified procedures for each instrument the students use for the course. Fridays are papermaking days, as well, and Haunreiter has been working with a few BSE students to get the paper pilot machine fully operational in time for the senior papermaking class this winter (which will led by Shannon Ewanick and taught jointly with Professor Dichiara). His goal is to have the students more directly engaged in the process, and he’s been writing new procedures so they can eventually operate the paper machine independently. If you haven’t had a chance to introduce yourself yet, we hope you’ll join us in welcoming Haunreiter to the SEFS community! Photo of Kurt Haunreiter © Karl Wirsing/SEFS; photo of papermaking © Kurt Haunreiter. BSE students at work in the paper lab last Friday, November 20. What kind of conference lasts for two weeks, allows you to completely immerse yourself in another culture and way of viewing natural resource management, creates opportunities to meet more than 100 forestry students from more than 40 countries, and provides a chance to experience the world of forestry through an international youth perspective? Why, the 43rd International Forestry Students’ Symposium, of course! Salina Abraham (left) and Miku Lenentine. Through the official establishment of the UW IFSA Local Committee in February 2015, Salina Abraham and I had the chance to be the first-ever delegates representing SEFS, UW and the West Coast at this amazing event. It’s hard to capture the magnitude of this experience in a few short paragraphs, but I will try! IFSA World is an international nonprofit run completely by students. It is the largest student-run organization of its kind, and it strives to be the voice of global youth in conservation and environmental management. With partners like IUFRO, CIFOR and FAO, IFSA truly is the voice for students and future resource managers, and it offers a direct pathway to attending and representing youth at events like the UNFCCC COP 2015 in Paris this year. Much of the business of running IFSA and cultivating this leadership takes place at the annual symposium, and this year’s gathering was held in the Philippines from July 28 to August 10. The range of activities and experiences there was incredible. At the Senate of the Philippines in Manila, we got to attend presentations from industry professionals and top researchers from the University of the Philippines, Los Banos. We participated in local natural resource management field tours, including planting mangrove trees, hiking through the Los Banos experimental forest (largest in the country), and visiting a rice museum to learn about the challenge of rice cultivation and balancing extractive resource management with food productivity. Miku at the rice museum. We also attended the IFSA General Assembly, which feels like a mini-United Nations. That’s where all of the elections and business decisions for IFSA World are conducted for the coming year. It was a very new and educational experience for me, and all protocols for behavior and communication were quite formal. Before anybody spoke, for example, they were expected to stand and state their name and country. As part of this year’s General Assembly, as well, Salina and I were both nominated for IFSA World leadership positions, and we are now a part of the 2015/2016 IFSA World Officer team. Salina serves as the International Processes Commission Head, and I am the regional representative for the United States, along with a counterpart in Canada. Giving my talk, “People Matter – Effectively Gauging Social Acceptability in Natural Resource Planning,” was my first experience presenting my preliminary research results to an international audience, and my first experience speaking to a group larger than 50 people! I thought I would be a minority in studying human dimensions, but I was surprised by the number of people who said my presentation resonated with them. In fact, a major theme of the symposium was becoming a “society-ready” forester. One of the biggest things I learned from attending the symposium was that the term “forestry” is not just about silviculture and timber harvests. Forests mean life. Everything is forestry—it encompasses and is connected to terrestrial and aquatic ecosystems, too. We are all foresters in this sense, even me (I am apparently a social forester!). Another important takeaway for me was getting to know the other participants and learning more about forestry conditions in their countries. The level of informal knowledge we shared was amazing, even with simple questions like, “What is your forest like?” Also, with more than 100 of us traveling everywhere together in overstuffed open-air taxis called Jeepneys, we all grew quite close. We ate breakfast, lunch and dinner together, laughed together, got lost together, sang karaoke together, and many of us made new friends for life in the process. By far the greatest value for me from attending IFSS 2015, though, was experiencing an overwhelming sense of camaraderie and inspiration as I connected with my newfound peers and friends from around the world. We are all working on this together, ushering in a new generation of sustainable resource management for the future. And though the challenges we face are daunting, I am inspired to continue, inspired to do better, and inspired to create a new path forward together. I want to end with a special shout-out to Sajad Ghanbari, former SEFS student and current founder of a new IFSA local committee at the University of Tabriz in Iran, who inspired the whole thing by saying, “Gosh, why don’t you have a UW IFSA?” And now we do! In the last issue of Roots, our alumni e-newsletter, we asked our graduates: What was your favorite spot on campus—a place to study, to eat lunch, to go for a walk? Here’s what Tara Wilson (’14, B.S. ), who is working nearby as a research technologist with the Center for Conservation Biology, shared with us! Tara Wilson volunteering at “Meet the Mammals” last year. “Favorite spot on campus? Well, I don’t think I could pick just one. There are so many different places that are optimal for different things. First of all, hands down, the best place to go for a walk is the Union Bay Natural Area. Yeah, it’s a bit of a hike to get there but totally worth it! It’s a great place to see beautiful habitat, and I like to practice my bird watching (here I come, savannah sparrow!). As an undergrad, my favorite place to study and get work done was on the top floors of the Suzzallo and Allen libraries. Along the perimeter there are individual desks with tons of outlets and good lighting. Plus, you’re right next to huge windows, which is always nice to gaze out on our campus for inspiration—or procrastination. Whatever you need at the moment. We are very pleased to announce that our faculty search for an assistant professor in the area of forest ecosystem science and services is now approved and active. Ideal candidates will integrate forest ecosystem science with perspectives from one or more other disciplines (e.g., forest management, silviculture, hydrology, atmospheric sciences, economics) and appreciate the intersection of basic and applied sciences that characterizes SEFS. A Ph.D. or foreign equivalent in forestry, ecology, forest management, silviculture, ecosystem sciences or a closely related field is required. For questions about this position, please contact Professor Jon Bakker, search committee chair, at jbakker@uw.edu or 206.221.3864. We hope you’ll help us circulate the posting as widely as possible, and the review of applications will begin January 15, 2016! In 2007, the SEFS Alumni Group helped organize a volunteer event to plant a wooded area, now known as the Centennial Woods, to commemorate the 100-year anniversary of the College of Forest Resources. The chosen plot was a .67-acre site along the western edge of the Union Bay Natural Area at the Center for Urban Horticulture. Alumni volunteers originally planted 400 trees there, but without a long-term plan to maintain the site, only 40 survived. Also, some bare-root saplings had been planted in thick mulch rather than in the soil below; others were planted in less than ideal locations for the species, and they didn’t get watered after planting. These factors, coupled with the re-growth of Himalayan blackberry on the site, contributed to the very low survival rate. View of the site in 2009, two years after it was initially planted. During those first few years, future SEFS alumnus Jon Diemer (’14, MEH) and his wife Martha started spending varying amounts of time volunteering at the site, trying to save trees and keep the blackberry and other invasive species at bay, with bindweed and thistle among the most troublesome. Some of the other non-native grass species, as well, grow taller than six feet by late spring, blocking the sun from the young trees, and their roots often out-compete the trees’ roots. With only two people tackling these challenges, though, there was only so much they could do. Then, in 2011 Diemer enrolled in the Master of Environmental Horticulture program at SEFS and chose creating a restoration and management plan for the Centennial Woods as his research project. With some more help from his wife, other students, and student work parties, he was able to plant most of the trees that are out there now (about 250). The native species planted, in order from greatest to least number, include: Douglas-fir (Pseudotsuga menziesii), shore pine (Pinus contorta ‘Contorta’), western redcedar (Thuja plicata), western hemlock (Tsuga heterophylla), grand fir (Abies grandis), bigleaf maple (Acer macrophyllum) and vine maple (Acer circinatum). The non-natives from southern Oregon and California include incense-cedar (Calocedrus decurrens), redwood (Sequoia sempervirens) and sequoia (Sequoiadendron giganteum). While the woods have been better maintained than in the past, Diemer says the project would be a lot easier to manage with more help. This past summer, for example, with extended drought and record-breaking heat, proved especially challenging. Diemer and his wife spent 12 weekends trying to haul enough water to save the most stressed trees, and they did succeed in rescuing a few. Yet they didn’t have the time or resources to help as many as they hoped, and about a third of the 250 trees didn’t make it—including three larger trees (about 15 feet tall) that had survived from the original 2007 planting. The restoration has recently picked up momentum, though, and three work parties of ESRM 100 students have helped replace about 30 dead trees. Yet they still have about 70 more to plant this fall, so they’re hoping to recruit more volunteers to help with the planting, blackberry removal and subsequent maintenance. If you’d like to get involved, either on a short- or long-term basis, please contact Jon at jon.diemer@gmail. He would welcome any assistance you’re able to offer, whether through donations of trees, time or labor—and so would the woods! Photo of the site taken in 2013. This Sunday (11/15): Native Plant Sale! The Native Plant Nursery invites you to support and help promote the Native Plant Sale coming up this Sunday, November 15, from 10 a.m. to 2 p.m. at the Center for Urban Horticulture! The Native Plant Nursery is a student-run operation that provides plants to on-campus restoration projects managed by the student guild of the Society for Ecological Restoration (SER-UW). The nursery has an inventory of more than 2,400 plants native to the forests and prairies of Lower Puget Sound, including more than 70 different species. Their plants are sourced from plant salvages, donations from local business, campus research projects and classes, and from collected seeds. All proceeds from the sale go toward funding SER-UW restoration projects on campus, and providing horticulture learning opportunities for UW students. Learn more about SER-UW on Facebook and on the group’s website, and if have any questions about the Native Plant Sale, email sernursery@gmail.com! SEFS doctoral student Shannon Kachel recently led the capture and first successful satellite collaring of a snow leopard (Panthera uncia) in Kyrgyzstan! The female, estimated to be between 6 and 7 years old, was caught near the border with China in the Sarychat-Ertash Strict Nature Reserve in the Issyk-kul Province of Eastern Kyrgyzstan. 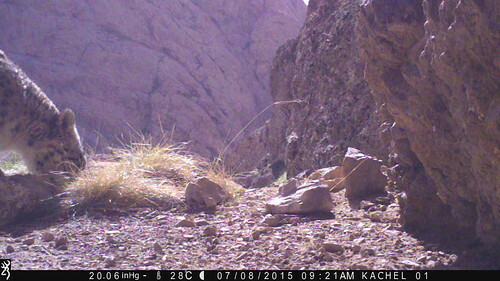 Camera trap photo of a snow leopard in Kachel’s study area. The news was particularly exciting since snow leopards are among the most secretive and least studied of the big cats. They are listed as endangered on the IUCN Red List of Threatened Species, and scientists estimate that only 4,500 to 10,000 adult snow leopards remain in the wild. The exact number is difficult to pinpoint, though, since few leopards are ever seen. That’s why the GPS collaring is such an important breakthrough, as it will open an unprecedented window into the leopard’s movements and range—and also help with broader conservation efforts in the region. So when Kachel was there for the actual capture of the female snow leopard, the experience was all the more unforgettable. Kachel’s research is among only a handful of telemetry or satellite-based studies of snow leopards, and it is the first to focus on a population that exists independent of domestic livestock and the conflicts between large predators and grazing. Collaring this snow leopard, he says, will finally give researchers the opportunity to investigate snow leopard ecology in rare depth. Among other questions, they’ll get to explore the behavioral and numerical dynamics between snow leopards and their prey (mostly ibex and argali), as well as the dispersal patterns of subadult animals (tracks near the trap site suggest the leopard may have been traveling with three subadults on the verge of dispersing to find territories of their own). Perhaps most critical for such a threatened species, this project will also give researchers a chance to answer the basic question of what kills snow leopards. It will help them build a more comprehensive understanding of direct threats to the species, and how to anticipate and account for the effects of human activities, like grazing and mining—as well as the risks climate change could pose in the snow leopard’s high mountain habitat. Eventually, Kachel hopes to expand the study and collar the wolves that share the landscape with the snow leopards, and to investigate the direct and indirect effects of competition and coexistence between the two carnivores. He also would like to extend his project to neighboring areas to investigate interactions between snow leopards and human activities. In the meantime, he can savor an incredible research accomplishment, which he says belongs to a wide range of partners. Camera trap photo of a snow leopard in the study area © Panthera/Kaiberen/NCMRD/SAEF/NAS/UW/SU; Kachel listening for F1’s signal a few days after fitting her with the GPS collar © R. Berlinski/Toledo Zoo/Panthera; video clip of snow leopard © Panthera/Kaiberen/NCMRD/SAEF/NAS/UW/SU.